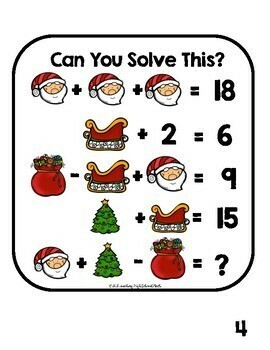 In this package, you will find 10 “Can You Solve This” puzzles that have become popular on the internet lately. Each puzzle is designed to allow your students to think critically and experience algebra without actually saying the word algebra. Each puzzle contains three or 4 pictures with unknown values. The object is to find the value of each picture. 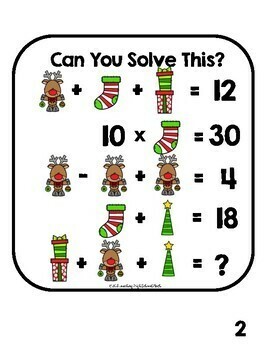 Most puzzles deal with positive numbers only, but some do contain problems where one or more of the pictures has a negative value. Students must be able to use the basic operations of addition, subtraction, and multiplication. 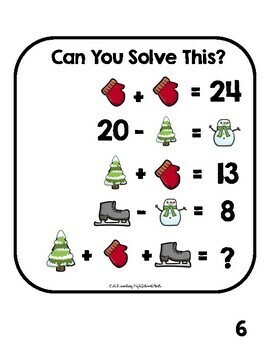 This would work well as a bulletin board or a puzzle that you project at the beginning, middle, or end of class. This is the Christmas/Winter Edition. 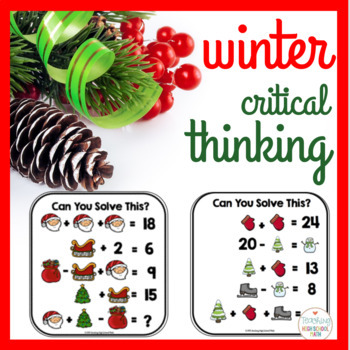 Puzzles that are included use Christmas and/or Winter Clipart.